Surprise the whole family with the exotic flavors of India. Butter Chicken becomes easy with the help of Knorr Chicken Cubes! 1 Begin by seasoning the chicken with salt and pepper. The next step is to prepare a large pan and get it nice and hot. Melt 1 tablespoon of butter and pour a little bit of oil to prevent the butter from burning. Fry the chicken until golden brown or for about 4 minutes. You may do this in batches because overcrowding the pan with the chicken lowers the heat and the chicken bleeds off moisture, thus preventing it from becoming brown. Remove the chicken and set this aside. 2 In the same pan, throw in the onion and cook this for about 8 minutes, stirring frequently until it becomes tender. Sprinkle the cumin, ginger and garlic and cook until you can smell the lovely aroma from the spices. Give this a good 30 seconds. 3 Next is to pour tomato sauce and 1/2 cup water and bring this to a boil over medium-high heat before throwing in the Knorr Chicken Cubes. When the sauce is slightly thickened after continuously stirring it for about 5 minutes, it’s now time to stir in the cream and cook for about 3 minutes or until it is slightly reduced. 4 Gently slide the chicken back to the pan and simmer until cooked through. 5 Topping this dish with a good sprinkle of chopped cilantro will surely be a delight. 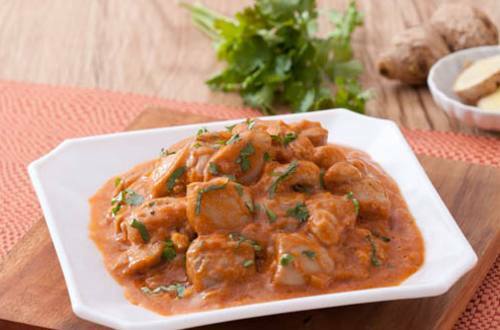 Wait and see the reaction on your family’s faces when they try this mouth-watering Butter Chicken being served at the table.